Grant Sorbo ’18 was initially skeptical about studying abroad. And when he changed his major to computer science, he thought it would be difficult to fit it into his schedule. His study abroad experience paid off in several ways, he says. “I gained a great deal of experience working with specialized technologies through my different classes, and came out with a semester's worth of new computer science knowledge. 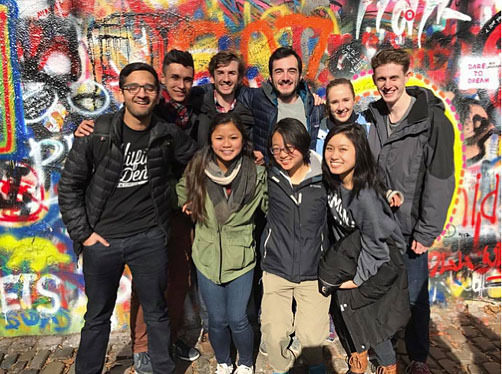 But, as I think anyone who studied abroad would say, you take much more from the experience than just the academic part,” Sorbo says. Heidi Kozireski at the Center for Education Abroad was especially helpful in answering questions about going abroad and how it would impact Sorbo’s Rochester life. He also worked with the staff at AIT. Four of his classes transferred back to count towards his B.S. in Computer Science, one of them being Theory of Computation which will directly count as CSC 280, a core major requirement. The three others will count towards advanced elective classes. “Wherever you go, do your best to immerse yourself in the local culture. Try learning the language, learn about the local food and why it's special, understand your city or country's customs, culture, and history whether troubled or triumphant, and meet people who live there.